Well, we took Lucy to the vet on Monday and had her re-xrayed to see if the stuff in her lungs has changed at all. Well, the good news is that there was no change in the xrays! So the vet is fairly certain that, instead of cancer, she has calcification of the lungs. They said that if it were cancer, even a slow growing type, that there would be some change. And there was no change at all. When I left the vet it was like a weight off my chest. A weight I didn’t even know I’d been carrying around for some months. I am so excited! Yay! Lucy is okay! Of course she is still 9 years old, so we watch her health pretty closely. But this is great news! And she is acting the same as she has been for months. So we are very happy for sweet Goosey Lucy! Now I need to get more blogging done, using our used cisco that we got off ebay! I took Lucy in to Dr Hennemen today. I just love Dr. Hennemen. I feel very good energy from her, and she really knows what she is talking about. We are so lucky to have her in our little part of the country. So anyway Lucy does have a lot of striations (I hope that is the right word) in her lungs. More so than spots. It reminded me of Mars and all the alleged canals that people used to think were up there. But Dr. Hennemen was not convinced it’s cancer. But we are going to treat her like it’s cancer. She did say that it might be calcification. She also said it looked like one of Lucy’s ribs had been broken a long time ago. Goodness… dogs. Man, they can hide pain so well. I wonder if it was when we had our rollover all those years ago in the snow. That’s the only thing I can figure, since she’s never been on her own really, except the week we went to Maine and put her in boarding with Levi and Angel. Hrm. So we are going to strengthen Lucy’s immune system, Vitamin C and E. Antioxidants too. And I’m going to give her more whole foods in her diet that are seasonally appropriate. And some cooling foods, too, like Celery and Duck. I wrote more things down and they are in my purse. But we are basically gonna see about getting her as healthy as we can. And then, in a couple months, get new x-rays and see if there is any more growth of this stuff in her lungs. So we have some hope. Oh.. and while I was gone, our regular vet called and my husband answered. They said they had someone look at Lucy’s x-rays as well and he said it looked, to him, more like calcification than cancer… so, I am a bit excited. However, still worried. Lucy’s energy level is still very low and she’s being cranky. But Dr Hennemen also said her lymph nodes are swollen and we have to keep a close eye on her. So that’s the scoop so far. Author CynthiaPosted on 25 February, 2008 Categories LucyTags Angel, Cancer, Health, Levi, Lucy, Snow19 Comments on Cancer or Calcification? Just a quick update on Lucy. She is doing okay. She is pretty low energy, and I do think she is lower energy than she has been before. And the swelling in her legs comes and goes. I hope it doesn’t hurt her or make her uncomfortable. She and I have been talking a lot.. before bed, or in the mornings. She likes to come and lay on me and we have a nice chat, ear rubs, and ear licks. I do the chatting, she does the licking, and I do the rubbing. She is such a good girl I want her to be happy and healthy for as long as possible. She is slowing down, but she still seems pretty happy for now. Let’s hope it stays that way. One of the things I fear most is regrets. I have regrets about Kip my shepherd mix… I wanted to give him more, spend more time with him, and I feel bad that I dragged him with me from bad relationship to bad relationship. But he was always there for me. And I feel bad that I made him go lay down too much instead of snuggling with him. He panted so much, it was an annoying habit of his.. but I loved him, pant and all. So I am afraid of having regrets with my current dogs after they die. I think I just have to have confidence that all my dogs have had good lives, and they are loved and they have given me more than I can even have hoped to give them. I love them all. I love Lucy, she is my heart girl, and she will always have a big piece of my heart. 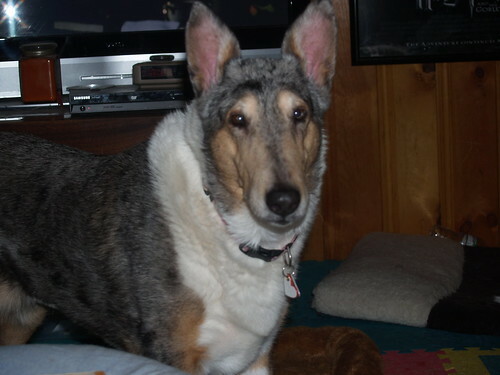 Lucy is our beautiful smooth collie girl. She does seem to be slowing down… with her cancer diagnosis and all. But she got to chew on a Kong a lot today, and carry it around and guard it, and guarding is one of her favorite things. Though she doesn’t like it quite as much as Levi does. Lucy is doing okay. I watch her closely now and I think that her low energy is because of her cancer. But my husband says she is still the same. I just wonder. I worry about her every day. Monday I am taking her to the holistic vet to see what she can do, if anything, and get her opinion. The rest of the dogs are doing well. I took Muffit and Tatum to Sugarhouse Park today for a walk. I haven’t taken Muffit out until now because he was sick. He’s done with his meds now and he is much happier, he is even enticing Tatum to play. He wants to play with Chase, too, but Chase isn’t ready yet. Having yet another new dog in the house has thrown Chase out of whack, but Chase is doing well and he hasn’t instigated any fights, which is nice. And we are helping him and making the other dogs respect his space, which is good and will help Chase adjust. Fortunately we don’t need any eca stack around here to lose weight, but I am cutting down Tony’s food as he is a bit chubby now. And Muffit gets a lot to eat, since he is still too skinny. I guess I’ll be up and down for a while with this diagnosis of Lucy having cancer. I have managed not to think much about it since Wednesday… thinking about it now just makes me cringe. Wednesday was a bad day. I was really down all day after the vet appointment on Tuesday. Even though it wasn’t too bad… what.. what am I talking about? Any cancer is bad! Ugh. The vet said they had ‘good news’ so we were really hoping to go in and have them say “It’s not cancer!”. But they did not. They just said they could not find a main tumor. I didn’t think that was good news at all. Anyway, Lucy gets to go to Dr. Kim Hennemen on the 25th so that will be good. I like her a lot. Her limp is doing okay… as is mine. LOL. I need some posture correction, and some ankle and knee therapy, it seems. I have agility all this weekend, both Saturday and Sunday. I hope it goes well. I’ll try to get and post up some videos. I run Chase and Levi. It’s AKC. I have to really be serious about it… get the Qs! Bah.. just have fun, eh? Yeah, just have fun. And hope I don’t hurt my ankle or my knee anymore.